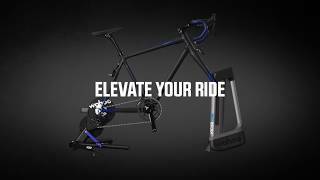 Introducing the Wahoo KICKR Climb, the latest innovation from Wahoo that will literally take your indoor training to the next level. Winner of a 2019 Design & Innovation Award, the KICKR Climb quickly raises and lowers your bike to match ascents of up to 20% and descents of -10% when paired with the new KICKR or new SNAP (2017 Editions). Climbing workouts and virtual courses are now more realistic than ever as the KICKR CLIMB recreates the grade changes in real time. The KICKR CLIMB physically adjusts your bike position to mimic real roads and mountain climbing. This allows you to naturally change position on the bike, engage climbing muscles, and improve pedalling technique while indoors, to become a more efficient and powerful climber outdoors. The CLIMB is compatible with Third Party Apps, so whether riding a virtual course or performing a structured workout, KICKR CLIMB blends assents and descents with resistance changes for a truly immersive indoor training experience. The world isn't flat: now, neither is your ride! - Unlock Mode allows the CLIMB to react to grade changes from external sources such as Zwift or TrainerRoad, or from your ELEMNT or ELEMNT BOLT GPS bike computer. - Lock Mode ensures the KICKR CLIMB will only respond to commands received from the remote.